- Despite the athleticism he showed coming into his rookie season, there wasn't any indication heading into training camp that Matt Milano would be as high up on this list in 2018 as he is. However, when Milano entered the starting lineup for an injured Ramon Humber, the defense changed. Although Humber played at a respectable level, Milano came in and did all the things the Bills want from their outside linebacker. Milano was a better player in coverage and much more dependable when dropping back, he was quicker to react to run plays, and he shows the speed at the position seems to be a prerequisite for head coach Sean McDermott and his defensive scheme. After being one of the top defenders on the entire team last season, Milano is now a full-fledged starter. Only turning 24 just a few days into training camp, the future is incredibly bright for the linebacker. 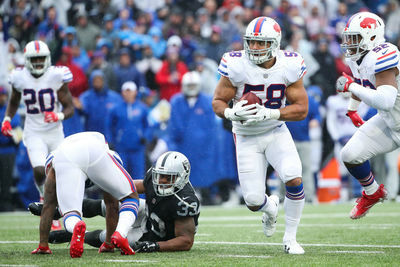 If he continues to play at the level he did as a rookie, or perhaps at an even higher one, the Bills have a legitimate late-round home run on their hands. - Heading into the upcoming season, Milano will resume a vital role on the defense as their top outside linebacker. Within that role, Milano will be a starter in the base defense and will continue on the field for almost any other offensive package they'll see. He will be one of the core defenders that are on the field for close to, if not 100-percent of snaps. Now with a running mate in Tremaine Edmunds that is much better suited for the role of middle linebacker than what the Bills had in 2017, there is a substantial chance that Milano's level of play increases in the upcoming season. Milano's real test will be if he can play the way he did for a full 16-game season -- which is something he did not have to do as a rookie.